The photo posted above shows a massive lineup of U.S. military armored vehicles on the Huey P. Long Bridge over the Mississippi River in Jefferson Parish, Louisiana. According to Before it’s News, this photograph was emailed to them by a very concerned reader: “The picture below was just emailed to Beforeitsnews by a very concerned reader who asked that we publish this to get it out to the world. 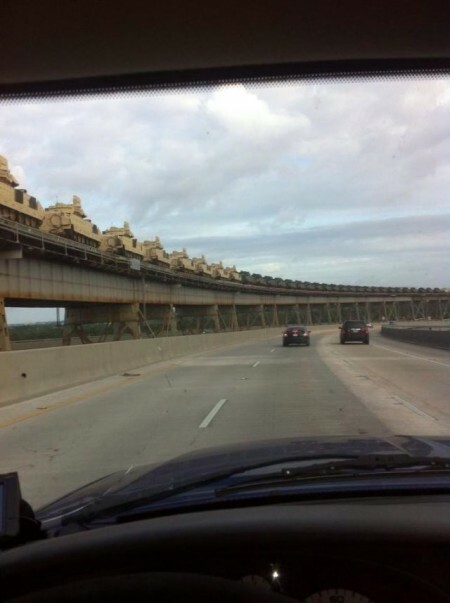 The picture shows a HUGE number of military vehicles being transported towards New Orleans and was just taken by our reader today, August 26th, 2013.” Barack Obama has pledged that the U.S. will not have any “boots on the ground” in Syria. If that is indeed the case, then where are all of those armored vehicles headed? Are we being lied to? Could they actually be going over to the Middle East? Let’s hope not, because a war with Syria could escalate into World War III very rapidly. Of course there is always the possibility that those armored vehicles could be moving for another reason, and that reason could be perfectly legitimate. But what we do know is that U.S. naval assets are moving into position for a missile strike on Syria in the eastern Mediterranean Sea. On Thursday, we learned that a fifth U.S. destroyer that is capable of launching cruise missiles is now joining the four that were already standing by. That is a lot of firepower. And there have been all kinds of reports about air assets moving into position for a strike on Syria. You can view a map of that shows the current deployment of U.S. forces around Syria right here. Yesterday my daughter called home. Her husband is an E-4 medic at Fort Riley, Kansas. She said that he came home and told her that starting Monday they are not allowed more that 50 miles from base, and this will go on through some time in October. She was really upset, he just joined and she really wanted to come home to visit for Labor Day. This was confirmation on all the rumors that I have heard about the Military not getting Leave on these dates! I don’t know, but there are so many “coincidences” happening right now that it is becoming very hard to just dismiss them. Jordanians are suspicious about US weapons and troops being deployed to the kingdom, even if Washington seeks to help its ally protect itself from a possible spillover of Syrian violence, experts say. Worried about the security of Jordan, which is already struggling to cope with around 550,000 refugees from its war-torn northern neighbour, the United States has kept F-16 warplanes and Patriot missiles in the country since a joint military exercise ended on June 20. A US defence official has told AFP that Washington has expanded its military presence in the country to 1,000 troops. According to our information, the regime’s opponents, supervised by Jordanian, Israeli and American commandos moving towards Damascus since mid-August. This attack could explain the possible use of the Syrian president to chemical weapons. According to information obtained by Le Figaro , the first trained in guerrilla warfare by the Americans in Jordan Syrian troops reportedly entered into action since mid-August in southern Syria, in the region of Deraa. A first group of 300 men, probably supported by Israeli and Jordanian commandos, as well as men of the CIA, had crossed the border on August 17. A second would have joined the 19. According to military sources, the Americans, who do not want to put troops on the Syrian soil or arming rebels in part controlled by radical Islamists form quietly for several months in a training camp set up at the border Jordanian- Syrian fighters ASL, the Free Syrian Army, handpicked. Nothing to worry about, right? Sadly, the truth is that if the American people want to stop this war from happening, they need to do it now. Once a conflict with Syria starts spinning out of control it will be impossible to stop it. And it looks like the bombing could begin at virtually any time. Dr. Roy Murphy is ex-military and he lives in Cyprus. He has been posting reports about the air power that is massing in Cyprus to his Twitter feed. 3/3 There have been seen F35 Lightening II's there, which technically don't yet exist! Make no doubt the west will strike #Syria. A 5th US Destroyer spotted 65km off the coast of Paphos, Cyprus, heading East. To me that's a payload of 450 Cruise Missiles. Gulp!